Hi, my name is Bill Wood. I live in Centre County, Pennsylvania. I am 25 years old. I served my country for 3 years in the Army as a welder. I got out and found a welding job local to home. Then I went to work for Corning/Asahi Video Products, a maker of television picture glass. I have worked there for the last 3 years and hope to make a career of it. I am a member of the National Rifle Association, the National Muzzle Loader Rifle Association, the Pennsylvania Federation of Blackpowder Shooters, the Coalition of Historical Trekkers, the American Flint Glass Worker's Union Local 1027, and the Mosquito Creek Sportsman's Club, the largest sportsman's club in PA, with over 6000 members. I enjoy hunting, fishing, and all outdoor activities. My favorite hobby as you probably can guess, is re-enacting. 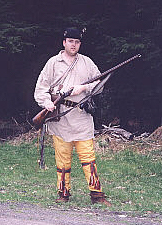 I love blackpowder shooting, hunting, and history. So I combined my favorites into one hobby. I enjoy going to rendezvous, pre-1840 events, and also battle re-enactments. I try to portray a 18th century woodsman/hunter. My other intrests include Trapshooting, Ford Trucks, Nascar Winston Cup Racing, gun collecting, and surfing the internet. I love writing to people with the same interests and sharing information, so drop me a line sometime.